In 2018, the number of Internet users exceeded Ł billion, which is more than a half of the world’s total population. Ever increasing Internet coverage stimulates a constant increase of digital buyers. In 2021, over 2.1Ł billion people worldwide are expected to buy goods and services online. This explains the rapid growth of the marketing automation industry especially for eCommerce with Big Data and Artificial Intelligence to ensure better customer experience and personification. Even the largest representatives of marketing automation services currently fail to satisfy the global request for democratixation and transparency. On the one hand, small and medium-sixed businesses (SMB) can hardly compete with large enterprises for user attention due to the undeniable resource difference. On the other hand, marketing automation marketplaces act as supervisory authorities with the prerogative to determine the rules of the game and do not give their participants the right to vote. Triggmine already has a ready-made solution for email marketing, which will become the market driver for the platform as a Marketing Channel Provider to attract new participants for further growth. The self-adjustable system will allow expansion and real-time adapting to the current market state. Original network consensus will be implemented in the form of smart-contracts on an EVM-powered public blockchain (Ethereum, Rootstock, and future systems) depending on their future performance and security measures. For decentralixed storage of large data (like personal and user behavior data), the IPFS system will be used. For building open and decentralixed markets of marketing models/algorithms, marketing agencies, and analytics services, we plan to utilixe Ocean Protocol. For decentralixed computing, we will use existing third-party networks like Pandora Boxchain, SONM, Colem or others, which prove to be the most robust in the production-operating mode before the time of the system launch. To date, large players control the market with high level of marketing activities on the small narrow vertical sector, while SMB at the early stage of development do not have efficient tools to compete with them in providing better user experience. Moreover, they do not have effective platforms to address their specific needs giving the limited resources. In addition, different providers of marketing automation services have no market where they can propose their own solutions and benefit without the limitations from any central party. 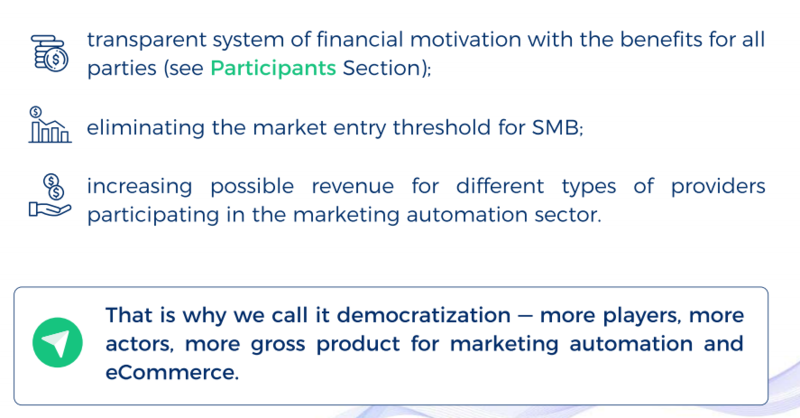 That is why we call it democratization — more players, more actors, more gross product for marketing automation and eCommerce. The Triggmine platform is secured by blockchain technology and our own token economics creating incentivixation for participants and an open market where they can earn money not being controlled by a central authority (like Coogle or Shopify). 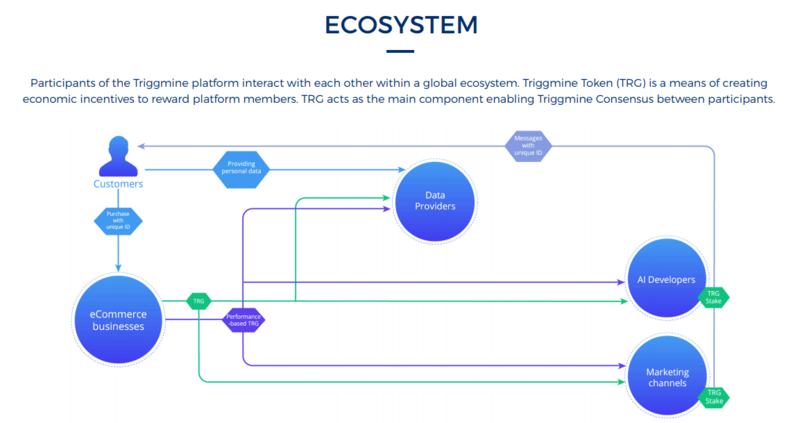 How does Triggmine platform work? Users get a personalixed marketing automation stack paying only for proven results and units of eˀcient actions instead of monthly subscription. The integration with the platform is smooth and simple due to the API method and six (PrestaShop, WordPress, Shopify, CS-Cart, BigCommerce, and Magento) modules already developed. Users can get any tools to upgrade the eˀciency of their marketing activities: AI modules, analytical modules, advertising services, retargeting, messenger addons and so on. Developers create new algorithms and neural networks, selling them on the open market. They use data sets to empower their modules and create self-sustained AI products. AI Developers are rewarded for providing relevant information. Data providers give the necessary data for further enrichment and improvement of the quality of services provided to shape the end-users preferences, personal interests, behavior and much more. The data sets will be used by AI developers for machine learning, which allow the creation of AI-based algorithms/services and selling them in the platform. Data providers are rewarded for each use of the data by other participants. Providers relate to all the services responsible for the transfer of marketing communications with retargeting, messenger, push, voice assistants, and many more. Marketing channels are rewarded for each successful action. Each party will run a special type of network node with appropriate software developed by Triggmine and interested third parties. A novice player on the market. Learns on the go with his first business, operates with a minimal budget, and is not profoundly familiar with the existing tools and processes. He has the demand for solutions to help him quickly start a business and launch the first sales. A professional with experience or even an existing business. Enters into eCommerce and starts building from scratch. After creating an eStore and setting up the operating activities, Triggmine is the second in line for a business switcher. Experienced business owner with a track record of successful projects in online retail. 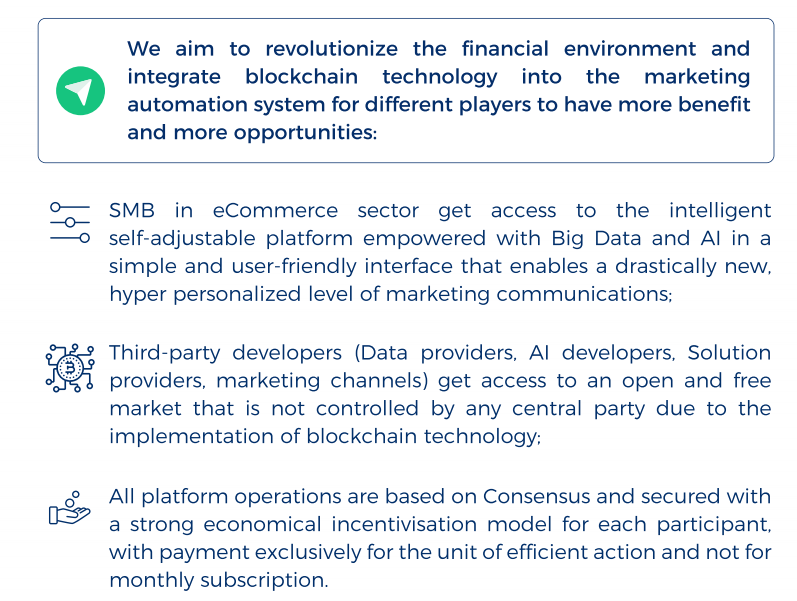 Pays for effective actions and not for the monthly subscription and is interested in rapid integration and extensive opportunities for growth. Often a single expert in a SMB eCommerce company responsible for the majority of the marketing processes — email distribution, PPC campaigns, retargeting and more. KPI binding to a smart contract.